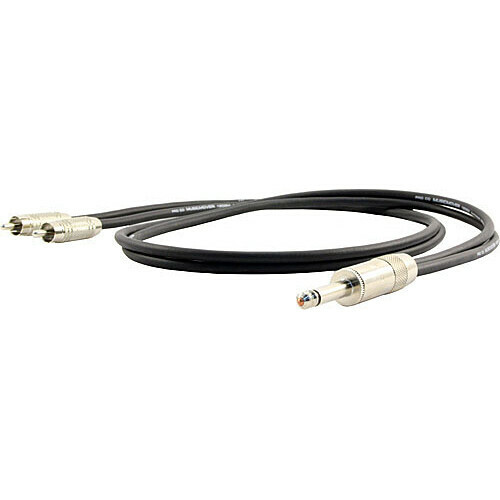 This Pro Co Sound Mono 1/4" Male to 2 RCA Male Y-Cable is a basic Y-cable that features a ShowSavers 1/4" phone plug on one end to two Pro Co HD RCA phono plugs on the other end. The wire consists of two-conductor 20-gauge wire, and 72% bare copper spiral shielding. Box Dimensions (LxWxH) 8.7 x 5.2 x 0.5"
Mono 1/4" Male to 2 RCA Male Y-Cable - 5' is rated 5.0 out of 5 by 1. Rated 5 out of 5 by Jims soundroom from Mono 1/4 Male to 2 RCA Male Y-Cable - 5 Mono 1/4 Male to 2 RCA Male Y-Cable - 5' by Pro Co Sound. This was the only place I could find one 5 feet long. Works fine.